When utilizing Queue Manager as a click-to-chat platform, it's important to be able to accurately know the current state of the Queue. You wouldn't want end-users trying to chat if the queue was offline, this would lead to user disappointment and dissatisfaction. You also may want a way of displaying how many experts are currently online, available, and ready to chat, to show the strength of your 'support-force'. Our Queue front-end has had support for these sort of requests for sometime, but in our most recent release, we've made these activities easier to perform. Let me walk you through a typical scenario, and I'll show you how easy it is. Scenario: You want to check the status of the queue on a simple web page button press. Replace the fields necessary with your environment, the Queue login ID would be something like 'Demo Support' or 'support@instant-tech.com' depending on how the Queues are set up in your deployment. In the code above, we've created a function getQueueStatus inside our Instant object that takes the Queue ID as a parameter. 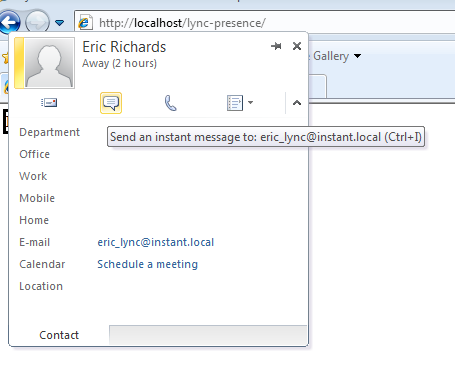 We build a 'url' variable with the FQDN to our Queue Server, and the Queue ID that we passed in. Once we have that, we do a simple AJAX GET request to the url variable we built. Once we get the response, our code with run through the 'complete:' section of our code and it will assess what the server has returned. We use jQuery's $.trim() function to strip any '\n' line breaks that may be returned with the data. The API call could return up to 12 responses, but we are only really concerned with 3. If we get 'na' as a response, the Queue is offline in Sametime, or it isn't a valid queue. This means our server can't see it. For this we are writing out to the Chrome/Firebug console Queue is offline, or doesn't exist. If we get 'STATUS_ACTIVE', our server can see the queue, it's online. For this we'll write out Queue is online. The other response we'd want to check for this the 'STATUS_AWAY' response, this means that the queue is online, but that all experts are currently busy. Inside these if statements, you could write your own code to execute when these status' are returned. You could have this function load with the page, and if the server returns 'na' you could disable the chat button and give a message the the chat feature is currently disabled. 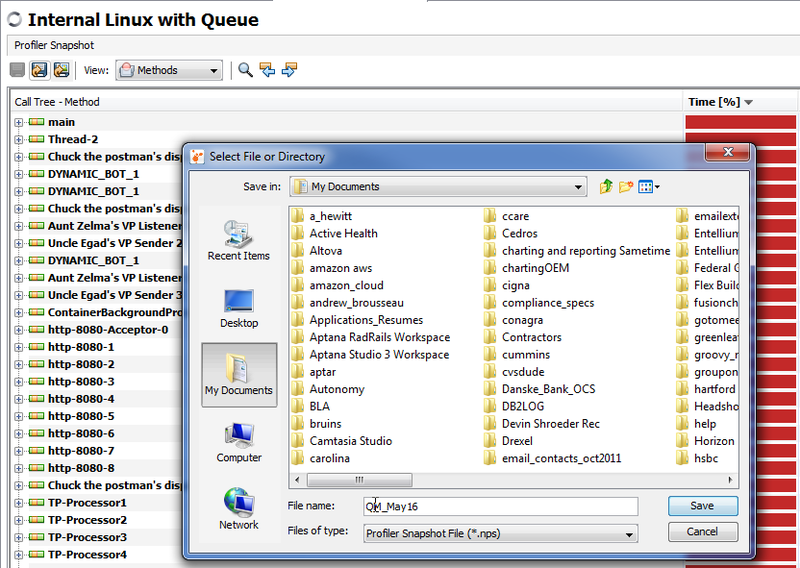 Recently, we have been involved in a rather large Queue Manager deployment running on a Linux environment. During this process, we have been reviewing various tools and techniques to help analyze and detect issues in a remote production environment. As part of this process, we discovered the value of JMX, VisualVM, and the tools associated with debugging Java applications. Most of these practices are useful on both Linux and Windows deployments. As a bit of background, our Queue Manager for Sametime application is built using Java and a collection of Java libraries. 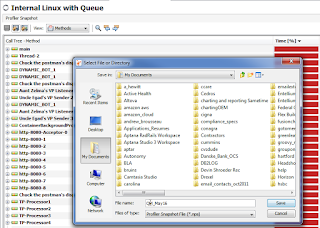 Queue Manager leverages the Sametime Java API for access to the core Sametime services, it uses the Domino libraries for accessing Lotus Notes/Domino services, and Queue Manager uses Spring as the main application framework. So, at a high level, Queue Manager is a Java Spring application running under Tomcat. Typically, we deploy Queue Manager on a Windows OS. However, during a recent deployment, we configured Queue Manager to run on a Linux server. 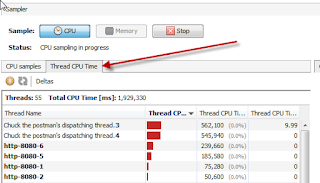 As part of this deployment, we wanted to remotely monitor the thread activity of the application, the CPU usage of the application, and identify any issues related to either thread usage or memory management. While there are some very useful tools (typically command line) to help with this type of analysis, we particularly like JMX and VisualVM. 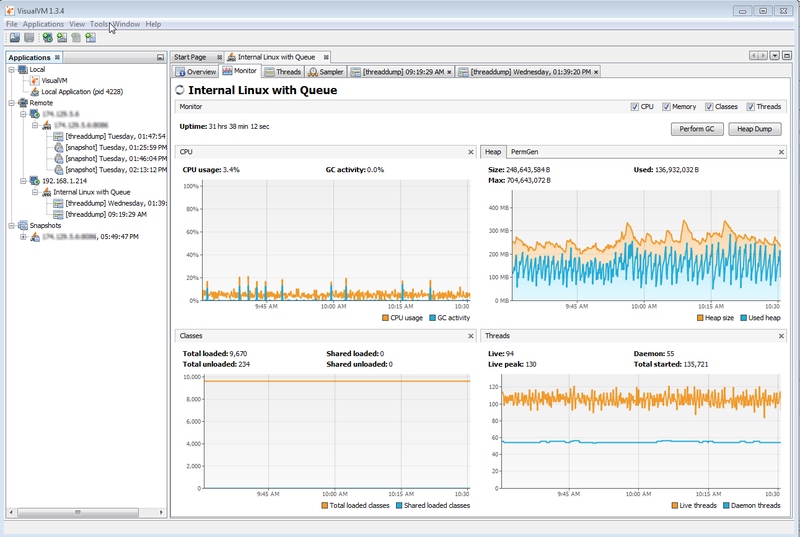 After enabling JMX on the server hosting Queue Manager, our application developers then connect to the JMX monitoring system using VisualVM. This allows our developers to monitor the performance, health, thread usage, and memory usage in real-time - using a very nice graphical display. The added advantage is that we can use VisualVM to both remotely monitor a variety of internal servers, as well as use VisualVM to review thread dumps and heap dumps (memory allocation dumps) from a remote production environment. 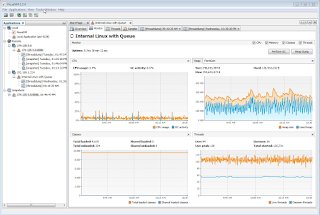 VisualVM is also very useful during extended periods of load testing and stress testing. Our internal developers created a variety of load testing tools in order to simulate the various Queue Manager users and systems. Our load testing suite includes the ability to scale the number of inbound Sametime IM seekers (people looking for help), the number of experts in a queue, the number of web service requests to the system, as well as experts entering and leaving various queues. 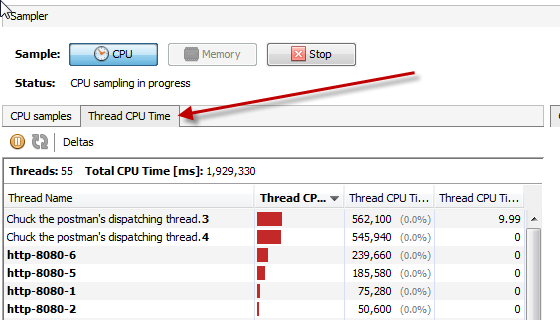 During these load tests, VisualVM provides a real time display of the threads, memory, and CPU usage for the system. In addition to high level monitoring, VisualVM enables the ability to sample (collect) data over a specific period of time. 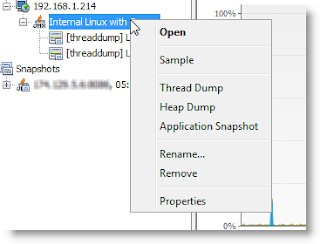 So, during certain load testing cycles, we can enable VisualVM to sample the activity of the system and then we can review the data to inspect threads, CPU usage across threads, and memory allocation. While the ability to capture a thread dump is useful, we have found the ability to save and export a snapshot of the system, using the sampling module, to be incredibly valuable. 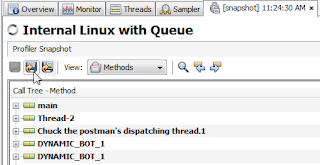 The 'sampler' area of VisualVM provides the ability to 'snapshot' the current system state and then export this information. The exported snapshot may then be transferred to another machine and opened using VisualVM. The ability to save profile snapshots, transfer these snapshots, and then inspect the snapshots using VisualVM has proved extremely valuable. We have found JMX and VisualVM to be invaluable tools during both our internal load testing and remote performance tuning and analysis efforts. JMX is a standard component of the Java environment, and the addition of VisualVM provides a compelling, and powerful, collection of debugging and analysis tools. This is a pretty concise presentation (converted to a pdf) detailing the steps to install Sametime 8.5.1. The presentation is from Lotusphere 2011 and was presented by Frank Altenburg and Volker Juergensen.